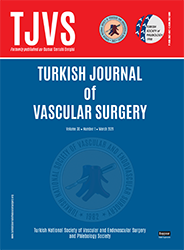 1Department of Cardiovascular Surgery, Health Sciences University, Gülhane Training and Research Hospital, Ankara, Turkey DOI : 10.9739/tjvs.2019.236 Objectives: This study aims to present the clinical results of patients administered rivaroxaban for the treatment of deep vein thrombosis (DVT) in terms of efficacy and safety. Patients and methods: A total of 78 patients (44 males, 34 females; mean age 60.9±20.6 years; range, 26 to 88 years) diagnosed with DVT had received rivaroxaban treatment at the Gülhane Education and Research Hospital's Cardiovascular Surgery Clinic between August 15, 2014 and November 3, 2017 were included in the study. Deep vein thrombosis diagnoses of the patients were confirmed by Doppler ultrasonography. The patients" epidemiological and biochemical values were evaluated. Major-minor bleeding and recurrence that occurred during rivaroxaban treatment was investigated. Results: The mean follow-up period was 12.2±9.4 (range, 6-48) months. When anticoagulant treatments of the patients were examined, 21 patients (27%) were treated with rivaroxaban as initial treatment and 57 patients (73%) had transitioned from warfarin to rivaroxaban treatment. In patients using rivaroxaban, one patient had hypermenorrhea and two patients had epistaxis. Major bleeding was not detected. While three patients had alanine aminotransferase levels up to two times higher than the normal limit, none of the patients had clinically significant liver or kidney failure. Recurrent DVT or pulmonary embolism was not detected in the patients.